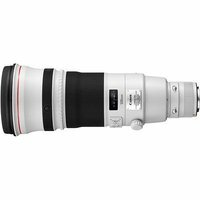 The Canon EF 500mm f/4 L IS II USM is a super-telephoto lens with integrated Image Stabilizer technology and a fast f/4 maximum aperture. It features a lightweight magnesium alloy and titanium construction, and its optical design includes fluorite and UD lens elements to tackle aberrations and distortions. The Canon 500mm f/4 L lens is perfect for wildlife, nature and sports photographers.